Collaboration applications are becoming increasingly popular in the enterprise space. Startup Huddle.net has been steadily accumulating innovative features to its business-friendly collaboration platform and quickly adding big name companies, including Samsung and Panasonic, as clients. Huddle is a network of secure online workspaces where you can share files, collaborate on ideas, manage projects and organize virtual meetings. Today, Huddle is adding several more useful features to its platform—web conferencing, integration with Microsoft Office, and a much-awaited iPhone app. Huddle’s web conferencing feature, which is similar to web-ex, lets users set up meetings, schedule recurring events, and share their desktop and content with other members of their workspace. Huddle has also sent up a partnership with InterCall, one of the world’s largest conference call providers, to handle phone conferencing. 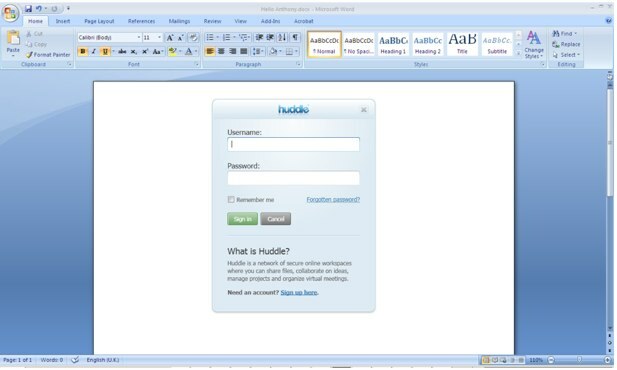 Huddle’s web conferencing tool is integrated with Outlook or Google calendar and users receive free conferencing minutes as a part of their monthly package and can also access low-cost international service plans. Huddle is also letting Microsoft office users seamlessly move between the productivity suite and the collaboration platform by launching a Microsoft Office plug-in that lets you save desktop files to Huddle save their desktop files directly into Huddle’s cloud-based storage, view and edit files, add new versions, request approvals and send notifications without opening a browser window. You’ll be able to access any edited Word documents that you’ve tweaked in the desktop app directly from Huddle. And this feature is enhanced by Huddle’s previous ability to use a Zoho-powered editor to work on Word and Excel files together directly in the browser. As a Microsoft BizSpark partner (we just announced Yammer’s BizSpark news a few weeks ago), Huddle is going to be developing a plug-in for SharePoint and and other Microsoft products in the near future. Currently, the MS Office plug-in works for the 2007 version but will be retrofitted to work with Microsoft Office 2010 next year. There was some speculation earlier this month about the fact that Huddle doesn’t have a mobile presence. But Huddle’s new iPhone app lets users have full access to document sharing, project tasks, discussions and whiteboards, as well as a complete view of the user’s personalized dashboard. Huddle can be also accessed on other cell phones by using third party applications such as Clustr. Huddle has also developed partnerships and integrations with LinkedIn and Ning to be included as apps on both social network. And the startup has a similar deal with Facebook, which allows you full access to all of Huddle’s tools within the social network. And Huddle is affordable—there’s a free, ad-supported version available from the Huddle web site (which includes 1 workspace and 1GB of storage); three premium levels (which have increased workspace and storage) and an enterprise version with multiple managers, customization, advanced security, training, and increased support services. And Huddle allows for unlimited numbers of users for each account. Andy McLoughlin, Huddle’s co-founder and director of strategic development, tells methat while 55 percent of Huddle’s users (McLoughlin says total users amount in the “Hundreds of thousands”) are based in the U.S., Huddle is making a big play for the U.S. in the coming year, opening up offices in San Francisco and other areas. Considering that many of Huddle’s big-name clients are based in the U.S. such as Edelman and Disney, this is a smart move. Because of the startup’s multiple services, Huddle faces competition from a variety of startups and tech giants including, Lotus, Box.net, and WebEx. 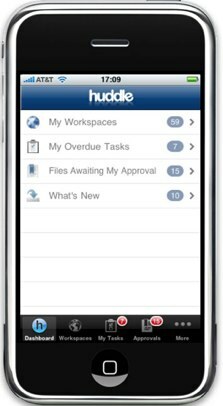 And of course, Huddle faces competition from Google Apps and the launch of Google Wave. But despite the competition in the “Enterprise 2.0” space, Huddle has been steadily gaining traction and should be able to give even Google a run for its money.